Gangaft agley, - Robert Burns – To a Mouse. With grateful thanks to Raksha and Deandra. "We must engage the Corsairs in battle and soon," Thorongil argued. "Daily, their strength increases and the threat they pose to us grows! Gondor must be protected at all costs." The other captains murmured their agreement. "You speak with passion, Captain Thorongil," Denethor said smoothly. "Almost as if you were a son of Gondor, or even her lord, rather than a hired sellsword in the Steward's employ. I am not risking good men's lives on your wild enterprise. This meeting is dismissed." The captains filed out muttering amongst themselves. Thorongil remained in his seat; his shoulders slumped in dejection. "Be not so downcast, Thorongil. You are still high in my father's favour despite your madcap schemes. Come and let us share a drink together to show there are no hard feelings. We both seek to protect Gondor, do we not?" Thorongil looked up and met Denethor's cool grey eyes. He struggled to contain his surprise at this sudden show of friendliness from Ecthelion's son. "I thank you for your kind offer, Lord Denethor," he replied, "but I have much work to do." "Come now," Denethor said. "I insist. You would not displease the Steward, would you? My lord father desires us to be on more friendly terms. There is a most discreet and well-appointed tavern in the second circle known for its fine wines." "I shall be delighted to join you then." Thorongil realised he had little choice in the matter. "My work can wait until later." "Good man." Denethor smiled; a smile that did not reach his eyes. Thorongil reluctantly followed Denethor through the streets, a guard trailing behind them. Never had the Eagle of the Star felt more disarmed than he did now by Denethor's sudden show of friendliness. The tavern, nestled between a goldsmith and a tailor, could easily have been overlooked were it not for the sign, "The Guardsman's Reward" which hung over the entrance. The dim interior was well furnished with cushioned benches and low tables and lit by beeswax candles. A magnificently antlered stag's head was mounted over the fireplace. The men seated at the table appeared to be mostly officers. Thorongil knew a few of them by sight. They mumbled greetings and quickly returned to their drinks. A comely young woman in a very low cut gown greeted then, which made Thorongil wonder if this was one of those establishments where more than food and wine was on offer in exchange for coin. At Denethor's command, she showed them to a small private parlour more brightly lit than the main room. A cheerful fire burned in the grate while the walls were decorated with tapestries, depicting the seduction of Aredhel Ar-Feiniel by Eol and the fall of Gondolin in vivid detail. Thorongil thought they were crude compared to those of Rivendell, or even the Citadel. "How might I be of service, gentlemen?" the girl asked. If she recognised either of them, she gave no sign. "Two glasses of your best wine." "Will that be all, sirs?" The girl left them. For a few moments, an awkward silence prevailed. "This is a fine tavern is it not?" Denethor said after a few moments. "I expect there is nothing like it where you come from?" "Not exactly, but there are many most hospitable taverns in Rohan. Their mead is a drink fit for the Valar!" "But Rohan is not your homeland." "It was for a time, as Gondor is my home now." "Never do you speak plainly, Captain." "Maybe I have nothing of import to say unless it concerns Gondor's defences." Just then, a serving maid entered with two glasses of wine. She recognised her customers and started in surprise, spilling a few drops on Thorongil's sleeve. "You clumsy oaf!" cried Denethor. "Can you not be more careful? I shall report you to your mistress!" The girl paled and anxiously wrung her hands. "I'm sorry, my lords," she stammered. Thorongil smiled at her reassuringly. "Fear not; anyone can have an accident," he said. "Let us forget about it." The girl scurried away thankfully. Denethor scowled but said no more. He rose to his feet for the standing silence then said, "Let us drink to Gondor." "The wine is good is it not?" Denethor smiled. "Drink up then! There is plenty more where that came from." "One glass of such fine wine will suffice for me, my lord." "Surely such a valiant man as you can take your drink? Come, Captain Thorongil, you insult me if you must be so abstentious." Denethor's tone was genial enough, but Thorongil recognised the undercurrent of menace. It was plain now why Denethor had brought him here. His rival intended to get him drunk. Either to loosen his tongue, or have him disgrace himself in some way so as to lose Ecthelion's favour. Maybe Denethor would pick some quarrel with him or hoped he would be caught in some immoral act? As well as fellow officers it was likely that some of the men in the outer room were Denethor's spies waiting to be called in at the appropriate moment to witness and report Captain Thorongil's downfall! 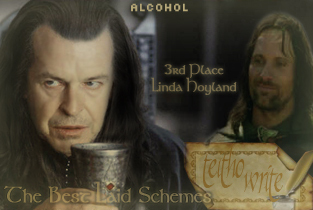 He would be trapped; for who would ever believe that Denethor had brought him here for anything but a friendly drink. Thorongil sipped his drink slowly and tried to think of a plan. Denethor had already drained his glass and was regarding him impatiently. "Excuse me; I must answer a call of nature." Thorongil got to his feet and made his way to the privy. Maybe he could make his escape over a wall and send a message to Denethor saying that he was feeling unwell? Much to his disappointment, the privy was inside rather than the usual outbuilding. The small window was impossible for anything larger than a small cat to climb through. The guard hovered at what appeared to be the tavern's only entrance. Just then, he spotted the girl who had spilled his drink earlier carrying some dirty glasses. She smiled timidly at him. Thorongil had a sudden idea. "Could you help me?" he asked, taking a silver piece from his purse. "I'm a good girl, sir," she replied flushing. "I just serve the drinks." "I have nothing shameful in mind. I should just like you to serve me mostly water with just a little of the Dorwinion in it to make the liquid appear as wine." "It is for a wager with Lord Denethor, which of us can remain sober for the longest. I have five gold coins bet on the outcome." He quoted the salary he would lose if dismissed in disgrace to make it less of a lie. The girl grinned at him. "Why certainly, sir! You can keep your coin for the amusement of beholding Lord Denethor in his cups!" "You can make better use of it than I," Thorongil insisted, placing the silver on the tray. He returned to Denethor whistling cheerfully. "You seem very cheerful, Captain," Denethor said morosely. He had already drained a second glass of the Dorwinion. "What is there not to be cheerful about with such fine wine on offer?" As he spoke, the serving maid appeared and placed a glass in front of him. When Denethor was not looking, she winked at Thorongil before scurrying back to the kitchen. Thorongil took a sip. It was mostly water. He drank it down, beamed at his companion, and licked his lips. Denethor immediately called for more wine. "This is Dorwinion, the finest wine known to Man. I expect you have never tasted it before," Denethor said after his fourth glass. "I have tasted many fine wines in my youth." "At the house of one who was like a father to me." "Who can replace a father though? That is if you had one to give you his name!" Thorongil clenched his fingers around his glass as he struggled not to respond to this insult with the fury he felt, knowing that to do so would only play into Denethor's hands. "My father and my mother were honourable folk both," he said at last. "Some peoples hesitate to speak the names of the dead lest it disturb their rest." "A strange custom. Here in Gondor we honour our dead greatly." "Indeed, we should respect the dead while caring for the living." Thorongil drained his fourth glass of 'wine'. His companion did likewise. "I might as well be dead for all my father cares about me," Denethor said morosely. "He has given all his love to you!" "How can a father not love his son above all?" Thorongil said evenly. "I am certain the Steward loves you deeply." "He loves you, only you! Why must you argue, man?" The woman who had greeted them when they arrived entered. She exchanged a glance with Denethor who nodded. "Is there any way I can be of service, Captain?" Her voice was low and seductive, almost a purr. "Some cake would be most welcome," Thorongil replied. "Is there nothing else?" She bent over, giving him a glimpse of her ample curves, which were barely contained within her skimpy bodice. Seemingly by accident she brushed against Thorongil, enveloping him inclouds of some exotic perfume. "I cannot think of anything, mistress." "I am here if you change your mind. I will bring you something sweet." "Shtars, man! Do you have water in your veins?" Denethor burst out as soon as the woman had left. "My heart is already pledged," said Thorongil. "I keep myself body and soul for a lady in my homeland." "Every man is entitled to sow a few wild oats." "Your conduct in such matters has always been above reproach, my lord." "I am not weak as lesher men. I am the Shteward's heir and the blood of Numenor runs true in my veins, while you, Captain, are a nobody, yet my father loves you more than he loves me! Sho do the men." Denethor pounded the table with a clenched fist with such force that his empty glass toppled over. He then sighed deeply and laid his head in his hands. Thorongil felt a sudden wave of compassion for his rival. Denethor was a great captain and a master of lore; yet he hated being counted less than first in the eyes of anyone he valued or needed. "Easy, my lord." Thorongil patted Denethor on the back. "Get your hands off me, churl!" Denethor glared. "I am the Shteward's heir. Sheven Shtones and sheven shtars and one white tree!" Just then, the serving maid appeared with a plate of cakes. Thorongil smiled at her and she gave him a knowing glance. "Please tell the guard standing by the door that his lord is unwell," Thorongil said. He took a bite out of one of the cakes. It tasted good. Thorongil awoke early the next morning. Despite his attempts to drink as little wine as possible, he had a headache, but his mind was clear. He wondered how Denethor was faring. He had instructed the guard to see him safely home to bed. He smiled at the recollection of Denethor singing a sad song in his fine baritone voice while leaning heavily on the guard's arm to keep himself from stumbling. Thorongil clambered out of bed and mixed himself some willow bark tea. He drank the potion and grimaced at the bitter taste then went back to sleep until the rising bell sounded. "Please tell Lord Ecthelion I will be with him shortly," Thorongil replied. It was unlike the Steward to summon him at so early an hour, but he could guess the reason. He hurried to Ecthelion's study and found the Steward seemingly engrossed in reading a report. Beside him on a chair, sat Denethor, his head in his hands and still wearing the same, but now crumpled attire from the night before. A large purple bruise covered one of his fists. "Ah, Thorongil, my friend!" Ecthelion put down the scroll and warmly clasped Thorongil's shoulder. "I summoned you in the hope you could throw some light on what has befallen my son. He claims that you led him astray last night, but I find that hard to believe!" "Lord Denethor suggested we have a friendly drink last night after the meeting," said Thorongil. "I fear the wine was stronger than we are accustomed to." "You do not appear drunk, though," said Ecthelion. "I did have a slight headache, my lord," said Thorongil. "Maybe eating some cake helped to keep me sober." Ecthelion turned to Denethor. "Why can you not be more like Captain Thorongil?" he snapped. "Whatever would your betrothed think if she heard you behaved like this? The Guardsman's Reward is a tavern of ill repute." "I heard it was a discreet establishment where gentlemen might enjoy a private drink," said Denethor sullenly. "I assure you that nothing untoward happened, my lord," said Thorongil. "I asked Lord Denethor's guard to take him home and put him to bed as soon as I realised the wine had gone to his head." "Sensible boy," said Ecthelion. "Now get yourself off to a healer, Denethor. I do not want to see you again until you are restored to a proper state of sobriety. I do not want to hear of you frequenting such taverns again in future!" Denethor left the room with as much dignity as he could muster. He cast a baleful glare at Thorongil as he passed him. "Do not be too hard on him, my lord," said Thorongil. "Lord Denethor is usually the most sober of men. Who could have guessed the Dorwinion would have been so strong?" Ecthelion's stern expression relaxed. "Dorwinion eh? I guess every young man learns a painful lesson the first time he tries it. Now I recall when I… Those were the days, Thorongil. Sit beside me and let me tell you about the old days. Denethor, alas, never wants to listen to my tales. Would you like some breakfast, my friend?" "Herbal tea and toast would suit me well, thank you, my lord," said Thorongil. He settled back in his chair and listened intently to Ecthelion's anecdote about trying to restore the White Tree to life with a glass of Dorwinion. "Would that Gondor's glory could so easily be restored!" said the old Steward sadly once the tale was concluded. "One day the White Tree will bloom again," Thorongil said, half with hope and half with conviction.